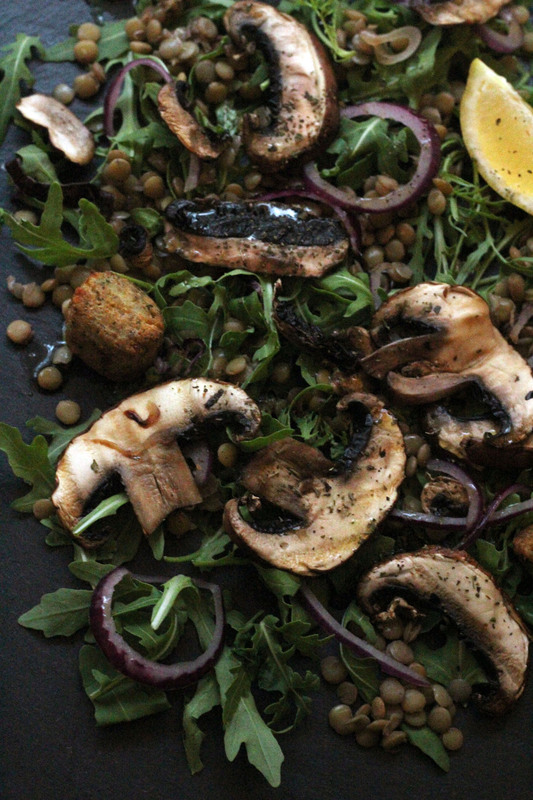 Mushroom and Lentil Salad a sophisticated salad full of refined flavours, delicious served as a side dish or as a vegetarian main course. This weekend I went back to my home-town to celebrate the christening of my eldest cousin’s baby boy. His name is Alikae and he is pretty damn cute. After 25 years of our family being incredibly close and tight-knit, barely growing in size since the last of my cousins was born over 10 years ago now, we are finally starting to expand! Some might say about time…but I’m still not sure I’m ready for it! Babies definitely still feel like something that happens to other people and their families. Jon has two older sisters who have 4 children between them and another on the way so I’m very used to their being babies around. Some of his cousins are also married and have children too, but mine in comparison are lagging behind! Out of our close school friends we are also the last unmarried couple and I don’t think it will be long before we are the only childless couple too. What is going on?! I look around and it’s clear that my friends and family are growing older around me. While they are off creating new families, Jon and I are still out enjoying the unmarried, childless life! I’m not ready to give that up just yet and I hope the baby boom happening around us doesn’t stop our friends and family coming out and partying with us! We came back on Sunday night after spending the afternoon (post-christening) with the two extended families, celebrating over good music and good food. On went the TV and I sat down to editing photos I’d taken in the week. It got me thinking…I couldn’t leave out my photo-set up, DSLR and all, with tiny hands about. I don’t think toddlers particularly like green lentils either… We loved Mushroom and Lentil Salad, and will definitely be making it again, so it’s probably best we are not planning on having a family any time soon. I had a lot of fun taking the photos for this salad. The shots are a little bit moody and quite grown up, shot on a slate tile with diffused light. I’ve not taken many photos on such a dark background before and whilst they are far from perfect I’m relatively happy with how they turned out. I’ll have to keep practising while I can! If you have any tips on photographing on black backgrounds please do leave them in the comments below!!! 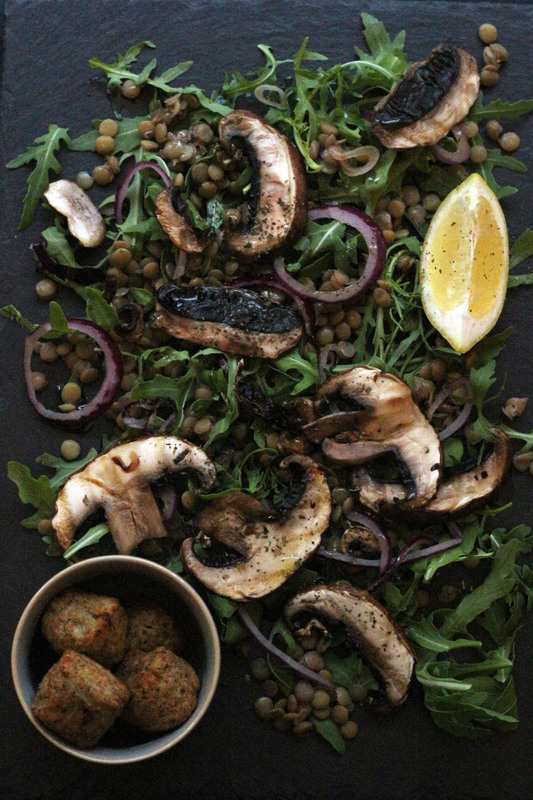 My Mushroom and Lentil Salad also has some quite sophisticated flavours – there is peppery rocket, earthy portobello mushrooms and robust green lentils all brought together with a silky smooth extra virgin olive oil and lemon dressing. We served ours with falafel on the side. Walnuts are also a great addition to add a bit more bite to the dish, but there really is no need. Green lentils retain a fair amount of bite when they are cooked so this salad is filling enough to be served up as a main course all on its own. 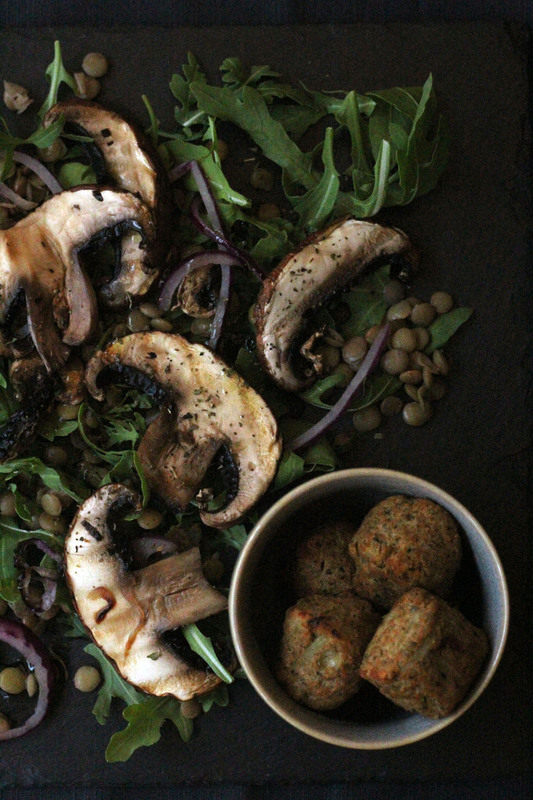 The meaty texture of the mushrooms also makes sure that even the more carnivorous folk around the table will enjoy this vegetarian salad. This warm salad is perfect for when you need a light lunch but its chilly outside. Cook the green lentils according to the packets instructions. This is likely to take 25-30 minutes depending on type. Drain and rinse thoroughly in cold water leaving to one side to cool completely. 10 minutes before serving, warm a griddle pan on a high heat. Place the thinly sliced mushrooms and onion on to the griddle pan and cook for 2-3 minutes on each side until the vegetables have softened. Remove from the heat and place to one side to cool. In a bowl, toss the spinach, rocket and green lentils with the olive oil, lemon juice, lemon zest, garlic and seasoning. It sounds like a nice occasion to celebrate the new baby:) I can completely understand how you feel about the baby boom and life decisions being made around you. I was in the same situation about 15 years ago and rode the tide…. People stopped asking me but sometimes it still comes up. 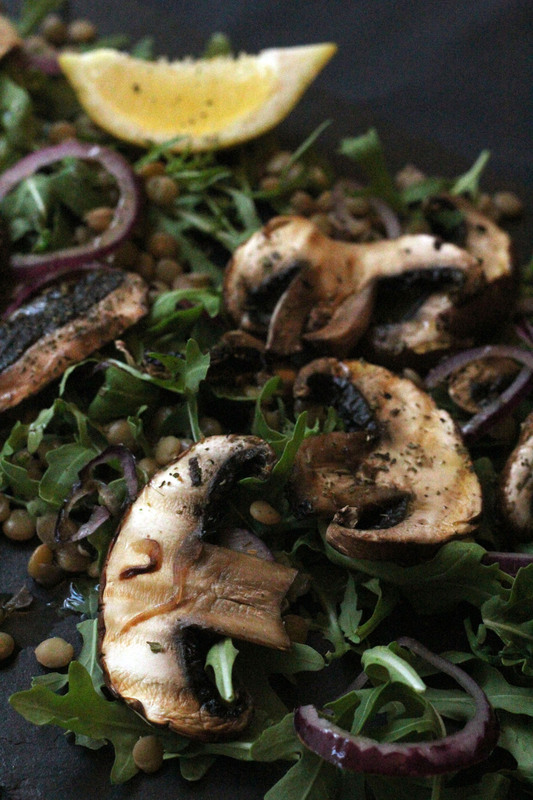 Anyway hang in there and your mushroom and lentil salad look divine . Love the dark hues… Unfortunately I don’t have any experience with DSL cameras although I hope to some day ! Cheers to you my friend and happy cooking! Kids definitely make blogging tough! Little hands are often just out of shot in my pictures. And these are stunning pictures of a lovely meal. What an interesting sounding salad. I’m not a gerat mushroom fan but am going to be trying a variation on this with the other ingredients! I love mushrooms but I have never tried them in a salad before. I will have to give this ago!